Exchange administrators always want to monitor Exchange online environment and get a clear overview of how it is performing. Due to the absence of those statistics information in the Exchange Admin Center, they have to write their own script to generate reports using PowerShell cmdlets, but at the end, always the results are not visually appealing. AdminDroid Office 365 Exchange Online Reporter gives you the ability to monitor your Exchange environment by giving you the insights and statistics about the mailbox size, mailbox usage, active & inactive mailboxes, incoming and outgoing mail traffic, spam mails, malware mails, etc. This free tool allows you to keep the data beyond the retention period defined by Microsoft. The exchange reports provided in this free tool helps you to meet security and compliance. AdminDroid Exchange Online Reporter helps you to monitor mailbox usage, mailbox size, mailbox growth trend, mailbox quota, active mailboxes, inactive mailboxes, mailbox never logged-in, etc. 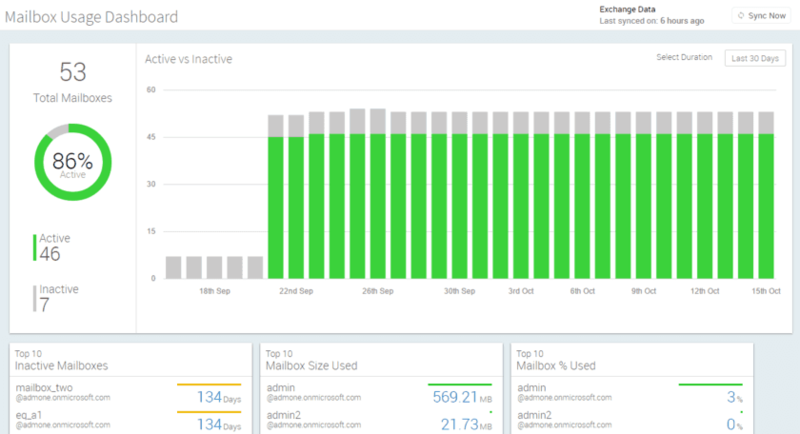 There is a dedicated dashboard available for monitoring the mailbox usage stats. 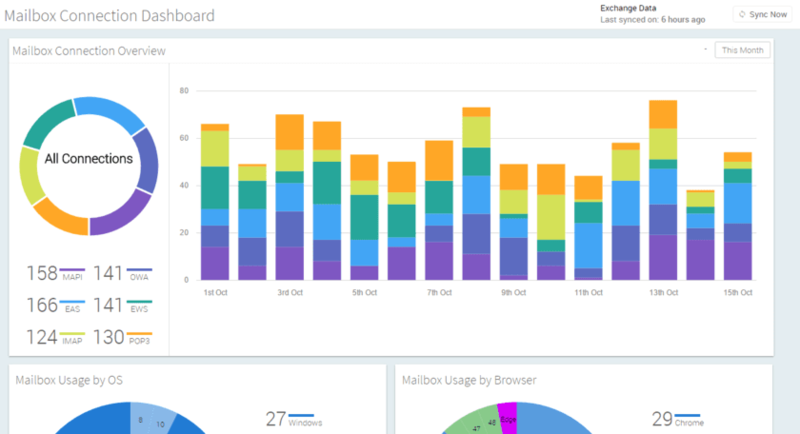 It gives you the precise analytics information along with top items on mailbox size used, mailbox percentage used, inactive mailboxes; further, you can get the mailbox active and inactive trend for past 180 days. Mail protection reports provide detailed statistics about daily incoming and outgoing spam and malware messages. It gives the summarized statistics about all mails, spam mails, malware mails and malware for both inbound and outbound messages; further, you will get the detailed report on those spam or malware messages. These detailed reports include info such as sender email, sender IP, recipient email, subject, message size, etc. Mail traffic reports help you to monitor all the incoming & outgoing mail traffics such as all mails, spam mails and malware mails. It provides a daily trend of overall Office 365 mailbox traffic; further, it provides a weekly and monthly summary of all the mails flows inside your Exchange online environment. 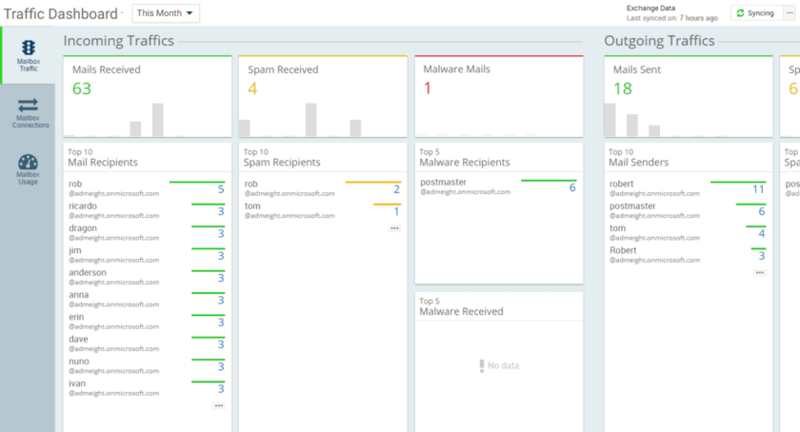 You can easily get to know about top 10 users who get more mail or spam or malware from the statistics available in the dashboard. Mailbox connection reports help you to determine how users access their Office 365 mailbox. You can get the daily access count of various connection types like OWA, MAPI, EAS, EWS, IMAP and POP3. Also, it gives the information about which operating system and which browser is used to access the Exchange mailbox; It helps you to verify whether any of the users are using the outdated browser or operating system. All these reports can be generated for user level as well as for your entire Office 365 tenant.